Survey says desperate? TEN roadblocks Family Feud across 3 channels. Family Feud is coming to get you, whether you like it or not. If the incessant promos and watermarks haven’t been been enough, now TEN announces the show will be rolled across its three channels at the same time. Family Feud will screen at 6pm on TEN, ELEVEN and ONE all week. They’re not even offering to do that for the Commonwealth Games, requiring viewers to switch from one channel to another to follow a single broadcast. 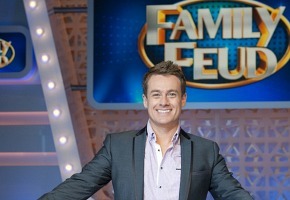 “By running Family Feud across our three television channels at the same time for one week, we are making sure that as many Australians as possible have the opportunity to see it,” said Programming Chief Beverley McGarvey. Because it is ‘simulcast’ the move means the ratings can be merged across three channels too. The show will also be repeated at 8am weekdays from tomorrow, leading into Studio 10, while Grant Denyer is a guest on The Project tonight. TEN had better hope the move does not backfire. Promotion is one thing, but overkill is big bloody risk. I admit to having watch Parts of 90210 on my nights off work twice a week prior to Neighbours when I could or was at home but this is just nuts.I wonder what Tori Spelling would have to right in and say.She would be a little outraged that they took off episodes of a show her late father created just because they were getting a little long in the tooth for a revived game show. Grant Denyer?! They could have picked someone else… Like many other’s comments, yes, he’s definitely had his day and should leave TV-land and get a real job that he’s suited to. What’s even worse than having removed all the good shows is that it (FF of course) is on all three channel and then encore screenings (which is just laziness on channel 10’s part, in my opinion) on Saturday and Sunday. He’s not even entertaining or half as funny as he was when he first started presenting the weather on Sunrise. Fingers crossed this show will not last long and all of our favourite shows be restored to their timeslots. A bit harsh. But agree the 3 x channels offers less choice. @Rob I feel the same about the multi channels filling in the weekend with catchups, 11 would be the worst at the moment followed by 7two with their Home and Away catchup. Put on different content mix it up. The first episode was not too bad. Grant was better than I expected. What will it rate? Probably 300-400s by the end of the week if you ask me. Uggghhh yuk hope they realise remotes can access channels outside the 10 network. Also a surprise double dexter ep tonight meant I missed a huge chunk of the 2nd episode. Not impressed with the last minute changes. I hope I’m allowed to admit here that their advertising strategy didn’t work as well as back fired on me. Plus put me off other stuff. Not unsurprisingly these days. I agree with those that say this three channel thing is overkill. Especially over multiple nights. Also if the people watching One or Eleven don’t realise it is on the main channel then Ten really are in trouble. That said I will admit to being curious about the individual as well as combined figures for this little experiment. This is messing with my guilty BH90210 pleasure viewing, not happy! @MediaMaggot – absolute rubbish. It’s a standard tactic in these types of games to press the buzzer before the question has finished being asked, in order to try to beat your opponent(s) or the clock. The quiz-master always ends up reading out a little bit more of the question before they are able to stop themselves, which the early-presser hopes will provide them with enough info to answer correctly. If you want to call them out on something, how about pointing out that the preceding 20 minutes was a waste of time since the final Q was worth enough points for either side to win. I think they stole that idea from Talking About Your Generation. There was a cheat in the very first episode! I actually think it quite a cleaver move on the surface…if it was only for one night. But when you think about it….all you are doing is angering loyal viewers of Eleven and One at 6pm. Overkill! I have no interest in watching this game show, that being said I havent been getting into 90210 either. Channel 11 was my favourite multi channel, however of late rather than playing decent content they seem intent at filling the weekend with catchups from the main channel and modelling/fashion shows. They should move Toasted TV back to the main channel to offer a point of difference to the morning block, and go back to the time shifting of US sitcoms on 11.